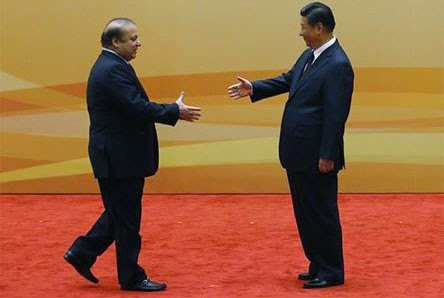 Prime Minister #Nawaz Sharif is on a two day visit to #China to attend the annual meeting of #Asia-Pacific Economic Cooperation (APEC) being held in Beijing. PM has declared this visit as the #Game Changer in the region especially for #Pakistan. As we are suffering from a very poor economic growth during the past few years as well as the crisis of electricity and other energy sources. There are reports that 21 #MOU’s have been signed between the two countries today worth 45 billion dollars. Most of these agreements are in power sector and there will be #Coal based Electricity generation plants built by the #Chinese. Government of Pakistan claims these plants will generate #10,600 #Mega Watts of #electricity and most of these plants will start generation by 2017. As we all know coal based electricity is cheap as compare to the plants on furnace oil or diesel. The energy mix in our country is by far tilt towards these #Furnace oil or oil based generated electricity which is the main source of CIRCULAR debt being mounted again and again during the last few years. So if government will be able to complete these plants in time there is every likelihood that we will see electricity tariff decreased by 2017. According to reports there are some agreements signed in Infrastructure sector too including Karachi-Lahore motorway, a #Dry port being built in Hawelian and Orange Line Rail project in Lahore. There is one agreement signed for #Cross-Border #Optical fiber project. All these agreements are very good and looks very beneficial for the Country but only if the following conditions met. · All the 45 #billion dollar what we are hearing the total amount involved is Investment and not loan for our country. · The agreements and contracts that State of Pakistan will be signing with these Coal-based power companies should be and must be in favor of the Country and all the interests of the State must be protected unlike the contracts that we have with the existing #IPP’s. · These agreements must be transparent and without any Kickbacks and commissions. Let’s hope these agreements bring prosperity and development in our country as our PM is promising.